We chose to visit this part of Languedoc partially because we enjoyed the game of Carcassonne, but also because of Henry James. When the iBookstore first came out in Canada it only had free Project Gutenberg texts available. I was eager to read books on my iPad, so one of the free texts I picked out was Henry James' "A Little Tour In France" from 1880. 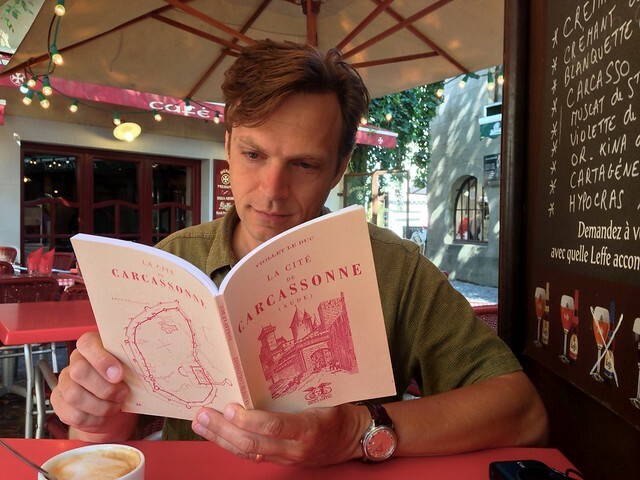 The heart of the book is two chapters dedicated to his visit to the old city of Carcassonne. James was there at an interesting time, since the old run-down fortress was in the middle of being "restored" into the majestic tourist attraction it is today. For Carcassonne is moving, beyond a doubt; and the traveller who, in the course of a little tour in France, may have felt himself urged, in melancholy moments, to say that on the whole the disappointments are as numerous as the satisfactions, must admit that there can be nothing better than this. 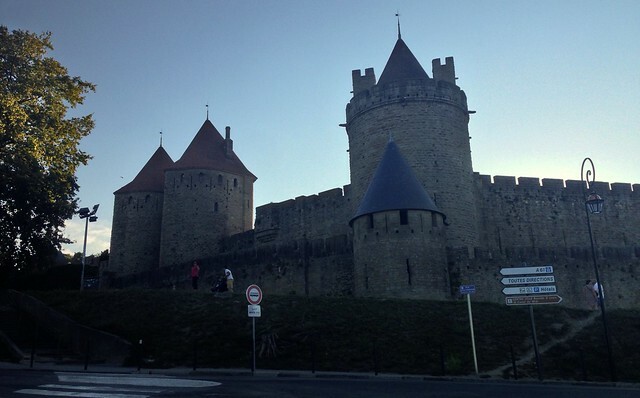 Carcassonne is on a key strategic location and has been a fortress since ancient times. The oldest city walls and towers date from the early fifth century A.D. built by the Visigoths but essentially Roman in design. These are surrounded by a second complete set of walls and towers, built in the High Middle Ages. Fallen into ruin and almost torn down in the 19th-century, it was restored to something similar to its original grandeur by Gothic Revival architect Eugene Viollet-le-Duc and remains one of his greatest legacies. Carcassonne dates from the Roman occupation of Gaul. The place commanded one of the great roads into Spain, and in the fourth century Romans and Franks ousted each other from such a point of vantage. In the year 436, Theodoric, King of the Visigoths, superseded both these parties; and it is during his occupation that the inner enceinte was raised upon the ruins of the Roman fortifications. Most of the Visigoth towers that are still erect are seated upon Roman substructions which appear to have been formed hastily, probably at the moment of the Frankish invasion. ... These facts I derived from a source no more recondite than a pamphlet by M. Viollet-le-Duc, - a very luminous description of the fortifications, which you may buy from the accomplished custodian. The writer makes a jump to the year 1209, when Carcassonne, then forming part of the realm of the viscounts of Beziers and infected by the Albigensian heresy, was besieged, in the name of the Pope, by the terrible Simon de Montfort and his army of crusaders. Simon was accustomed to success, and the town succumbed in the course of a fortnight. Thirty-one years later, having passed into the hands of the King of France, it was again besieged by the young Raymond de Trincavel, the last of the viscounts of Beziers; and of this siege M. Viollet-le-Duc gives a long and minute account, which the visitor who has a head for such things may follow, with the brochure in hand, on the fortifications themselves. The young Raymond de Trincavel, baffled and repulsed, retired at the end of twenty-four days. Saint Louis and Philip the Bold, in the thirteenth century, multiplied the defences of Carcassonne, which was one of the bulwarks of their kingdom on the Spanish quarter; and from this time forth, being regarded as impregnable, the place had nothing to fear. It was not even attacked; and when, in 1355, Edward the Black Prince marched into it, the inhabitants had opened the gates to the conqueror before whom all Languedoc was prostrate. I am not one of those who, as I said just now, have a head for such things, and having extracted these few facts had made all the use of M. Viollet-le-Duc's, pamphlet of which I was capable. It's interesting that Viollet-le-Duc was obsessed with Carcassonne, because he's as key a part of the city's history as Theodoric the Visigoth or Simon de Montfort. 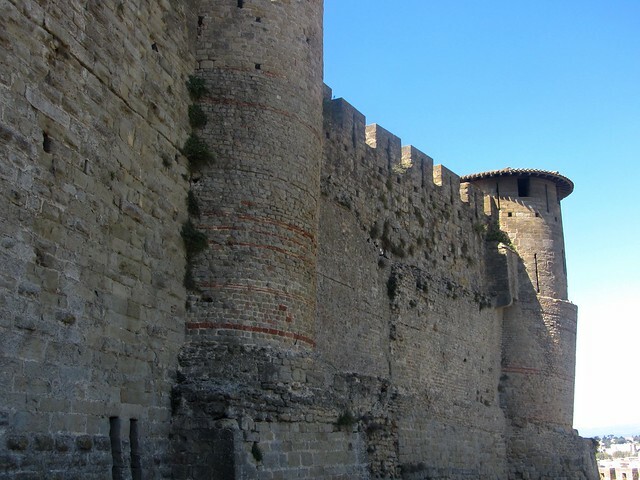 The Carcassonne we see today is only partially the original medieval fortress - it's also very much the early-19th-century invention of Viollet-le-Duc. His restoration project wasn't so much about preserving or faithfully recreating a specific past - instead it was to make a new hybrid of the past and his own ideas. In his own words, restoration is a "means to reestablish [a building] to a finished state, which may in fact never have actually existed at any given time". 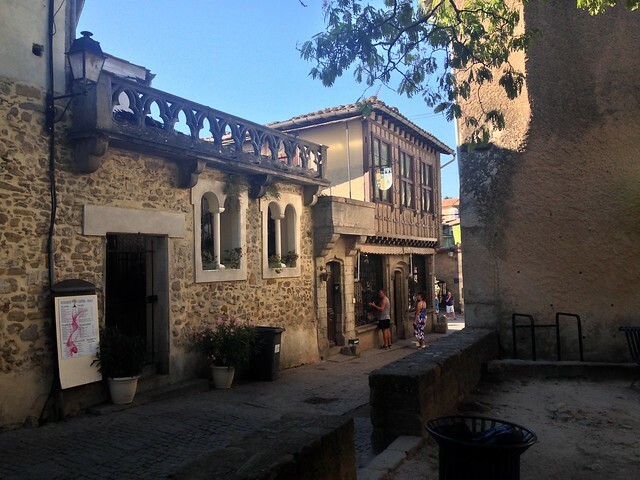 When Viollet-le-Duc had started "restoring" the old city of Carcassonne, it still had people living in it, with a whole town of ad-hoc structures built in the wide spaces between the two sets of walls. As you can see above, these were all cleared out. It is the queerest and most fragmentary little place in the world, as everything save the fortifications is being suffered to crumble away, in order that the spirit of M. Viollet-le-Duc alone may pervade it, and it may subsist simply as a magnificent shell. As the leases of the wretched little houses fall in, the ground is cleared of them. 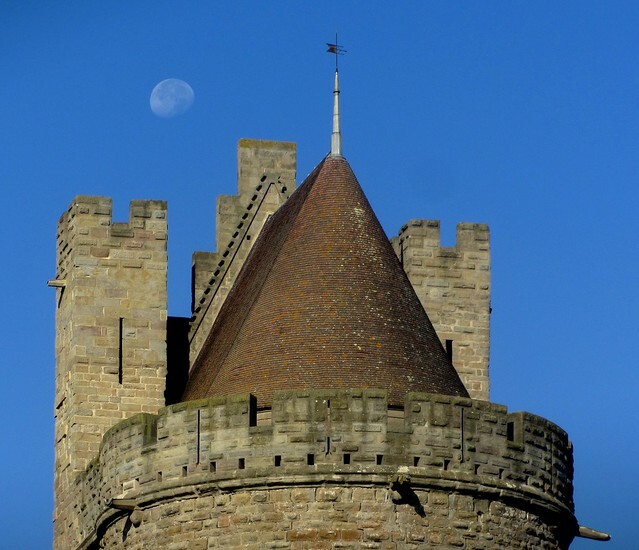 While the walls themselves are mostly originals, as are the main keep and the church, most of what is inside the old city of Carcassonne is significantly newer, much of it built to give a popular impression of a Medieval look. The Medieval Times feel is enhanced by the shops near the entrance selling replica Lord of the Rings and Game of Thrones swords. Even though the walls are original, the details aren't: Viollet-le-Duc rather controversially put conical slate roofs on many of the towers. Originally, these were probably either open-topped or had flatter, tile roofs like some of the older Visigoth towers. Without the roofs, the place would look much more like the grim fortress it was originally built to be, but with them it seems to be something out of a story-book. The whole place does feel like a fairy-tale or medieval fantasy come to life. This feeling is hard to pin down in Carcassonne, though, because not only have our current popular ideas of what the Middle Ages (and similar fantasy worlds) look like been inspired by Carcassonne itself, but the reconstruction of Carcassonne came from the same impulses that were behind Walter Scott's Ivanhoe and the whole Medieval revival movement of the 19th century - a movement which leads directly to things like Dungeons and Dragons, Skyrim, and Game of Thrones in our time. Carcassonne feels like a fairy-tale because it's supposed to - it was (re)built for that. So what did Henry James think of this restoration project? For myself, I have no hesitation; I prefer in every case the ruined, however ruined, to the reconstructed, however splendid. What is left is more precious than what is added: the one is history, the other is fiction; and I like the former the better of the two, - it is so much more romantic. One is positive, so far as it goes; the other fills up the void with things more dead than the void itself, inasmuch as they have never had life. 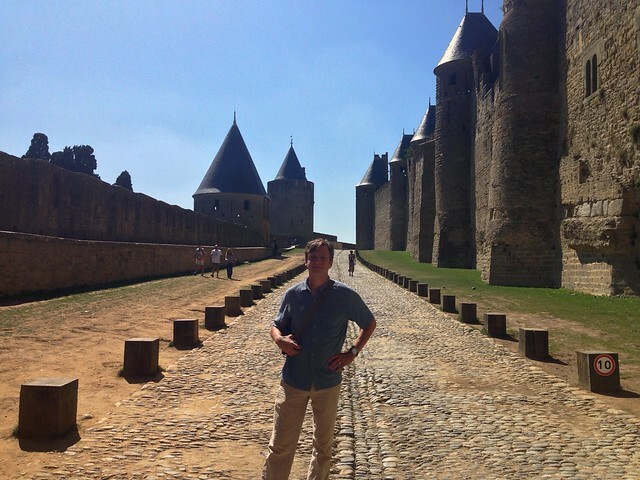 After that I am free to say that the restoration of Carcassonne is a splendid achievement. Coming from over a century later, my postmodern self would argue that history is of course fiction too, and even a ruin can have its own aesthetic agenda. 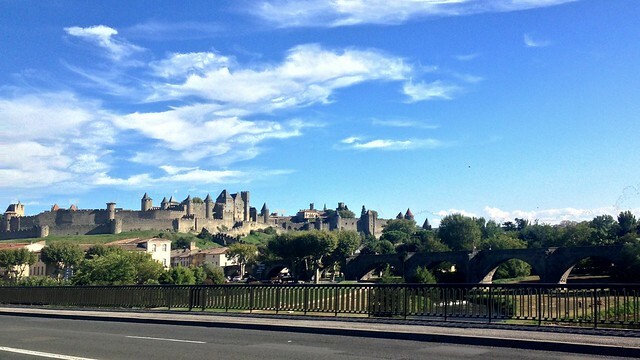 Over time, too, a recreation becomes its own kind of historical artifact as well - and Carcassonne is as much about the 19th century now as it is about the 5th or the 14th. But I do agree that it is splendid.